I have five different Visconti inks, and use them all in rotation. They are dry writing inks, (but not as dry as say, Pelikan 4001), and I use these inks to tame some of my 'gushy' wet fine and extra fine nibs. Each bottle comes sitting on its own plinth, and has a clear plastic cover that fits over the bottle and plinth, making for easy storage. Visconti is one of the few inks I own that actually exhibit shading through an extra fine nib. The Pen Company response to the instability of the bottle is spot on, and mirrors my own first bottle of Visconti Burgundy, which, distracted by my dog as I drew the pen nib out of the bottle, led to it toppling over and losing half the bottle onto the microfibre cloth on my desk. Cut to five years later, and I visited a small pen shop in Ypres, Belgium. They were having a promotion of Visconti Pens and inks, and they offered me a try of any ink I fancied. I chose the blue black, and the lady took up the encased bottle, removed the plastic cover, turned the cover upside down and placed the bottle inside it. It fits very securely, she then took off the cap... and the rest is history. Apparently this is how you should use the clear cover and bottle in unison for safe filling, but Visconti don't pass that on. Never a drop spilt since...hope this helps. Ordered this bottle from the website and it came promptly and was well packed. 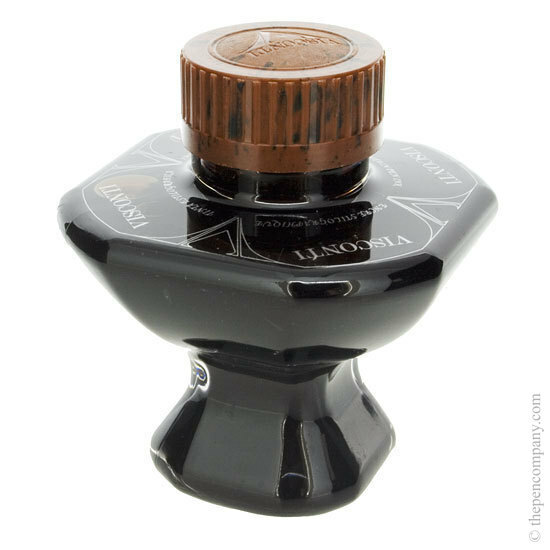 Everyone who used Visconti ink was very disappointed when they changed the bottle several years ago. It used to come in a glass bottle inside a two part card box which slid apart and which users really appreciated. We can't understand why they changed it to this plastic version: it can't have been that much of a saving and it has upset a lot of people. Both this new version and the original have the Visconti design which allows easy filling when the level gets low, but you do have to be careful with it while it is still full (the original you could leave in the box to start with to secure it while filling). Although it is not cheap, Visconti ink is still very good and much more economical than some of it's rivals.